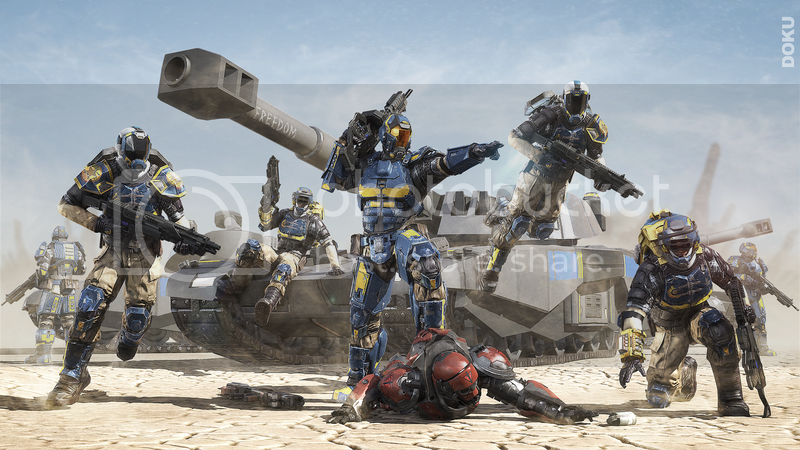 Planetside 2 is an MMO FPS and as it is a game that everyone has, what with it being free to play on PS4, a few of us were thinking it might be fun for a group of us to team up on here. But for that to happen you need to belong to the same group and be on the same server. And we are on the Ceres EU server. Getting a good streak going is damn hard, my best one was simply driving around in a truck, two guys on turrets mowing down infantry. Managed to dodge quite a few rockets, all was going brilliantly until I crashed into some trees. If you do load it up, I advise you to mess around a lot with the menus once in game, customise what you can, choose a class that works for you. Light infantry get jet packs, Heavy infantry get extra shields to absorb fire which you need to activate manually, engineers repair vehicles and give out extra ammo as well as getting turrets they can put down, medics heal people, and infiltrators have stealth abilities, get sniper rifles and can hack enemy consoles. Be sure to teleport /warp to an area where there are actually some enemy soldiers. The game falls down by putting newbies into an area that is usually empty and where there is nothing to do, you need to manually warp yourself to an area where the action is happening. Worth a try considering as it's free, let us know how you get on. Can't wait to try this out when I get my controllers back. Too bad you can't choose the servers. I would have to download the EU version to play on them. Unless I'm missing something.